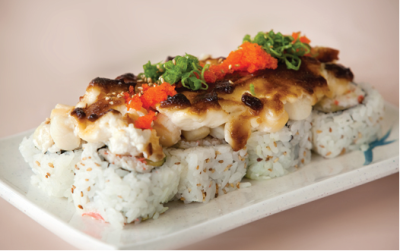 California Roll W/ Shrimp and Albacore on top and W/ Sauce. 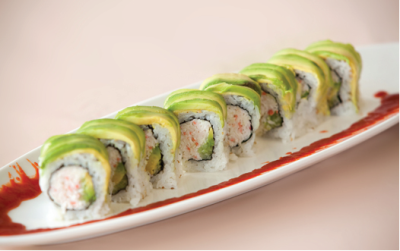 California Roll W/Fresh Water Eel, Avocado on top and W/ Sweet Sauce. 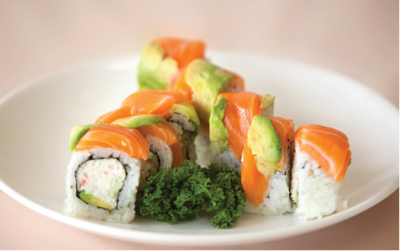 California Roll W/ Salmon, Avocado on top and W/ Sweet Sauce. 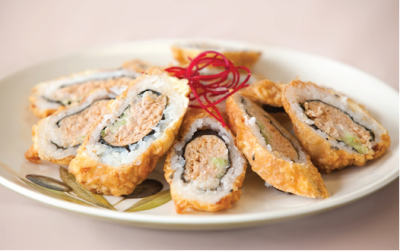 Deep Fried Spicy Tuna and Avocado w/ Sweet Sauce. 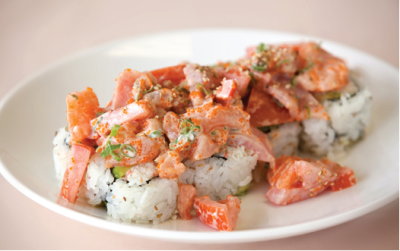 Extra Spicy Tuna Roll W/ Salmon and Tuna on top. 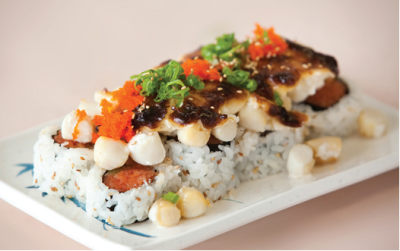 Shrimp Tempura inside and Spicy Tuna on top W/ Sweet Sauce. 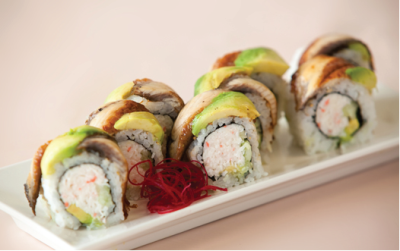 Shrimp Tempura inside w/ Fresh Water Eel and Avocado on top w/ Sweet Sauce. 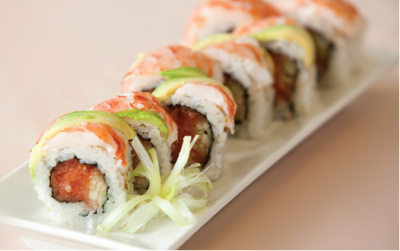 Spicy Tuna inside w/ Shrimp and Avocado on top w/ Sweet Sauce. 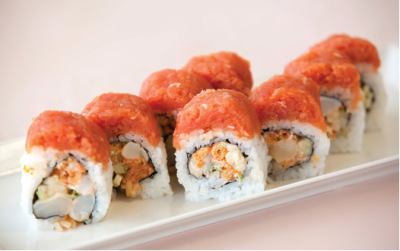 Spicy Tuna w/ Baked Scallops on top. 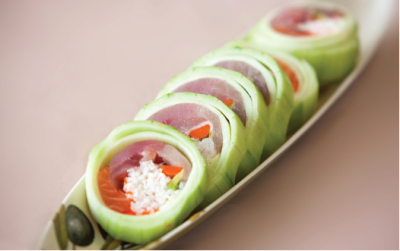 Albacore and Cucumber inside w/ Salmon and Tuna on top w/ House Special Sauce. 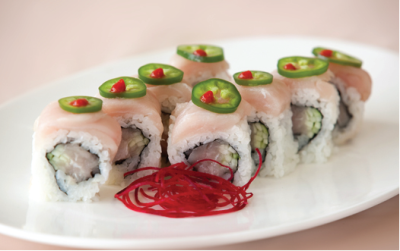 Albacore and Cucumber inside w/ Albacore and Jalapeon on top w/ Sauce. 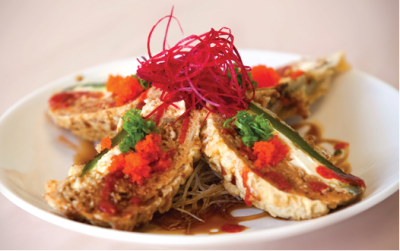 Shrimp Tempura inside w/ Tempura Flakes w/ Sweet Sauce. 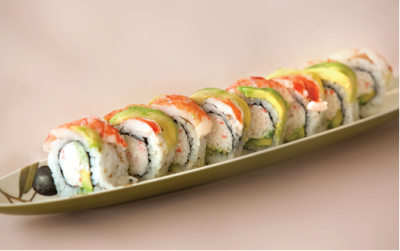 Crab, Cucumber, Avocado, Tuna, Salmon, Yellowtail, and White Fish w/ Soy Paper. 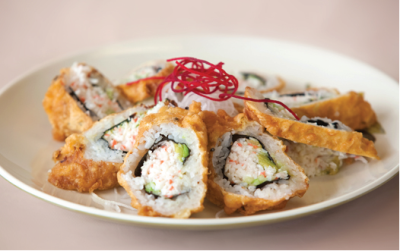 Shrimp Tempura, Cucumber, and Avocado inside w/ Shrimp on top w/ Sweet Sauce. Deep Fried Fresh Water Eel and Yellowtail w/ 1sweet Sauce. 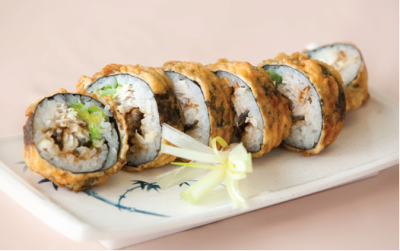 Soft Shell Crab, Avocado, Cucumber, Gobo, and Smelt Roe. 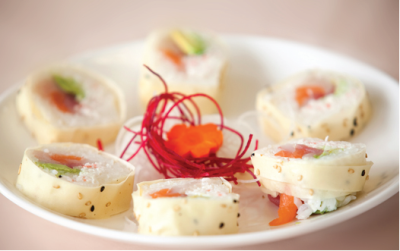 California Roll W/ Cooked Crawl Fish, Mayonnise, and Smelt Roe. 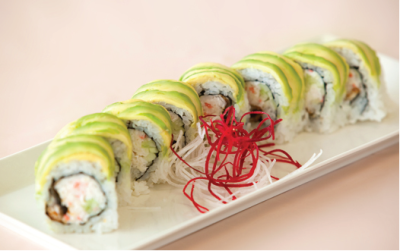 Crabmeat, Chooped Shrimp, Cilantro, Cucumber w/ Avocado. 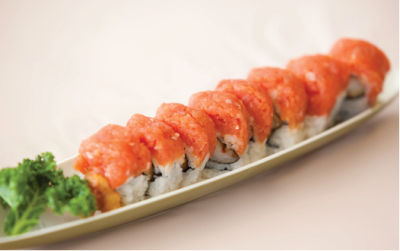 California Roll W/ Spicy Tuna on top, and Baked w/ Sweet Sauce. 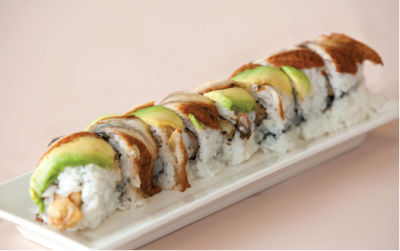 Fresh Water Eel, Crabmeat, Cucumber and Avocado on top w/ Sweet Sauce. 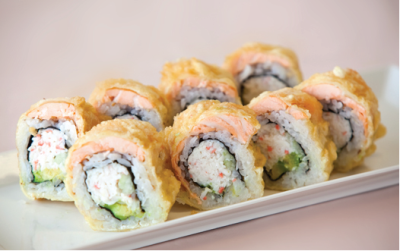 Deep Fried California Roll W/ Salmon and w/ Mayonnaise and Sauce. 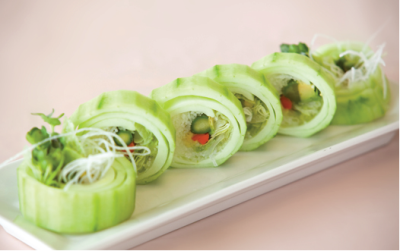 Assorted Veggies (Avocado, Gobo, Lettuce, Asparagus, Sprout, Radishy) Wrapped w/ Cucumber. 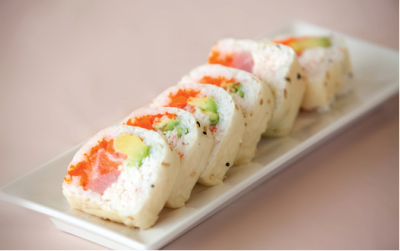 California Roll W/ Assorted Fishs, and Tomatoes w/ Mixed Sauce. 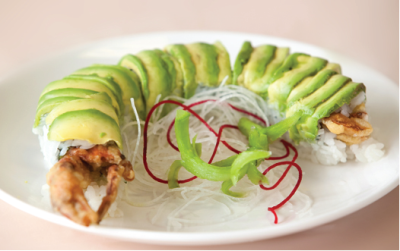 Soft Shell Crab, Crabmeat and Cucumber w/ Avocado on top w/ Sweet Sauce. 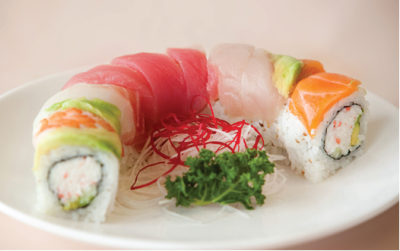 Tuna, Salmon, Yellowtail, Albacore, Crabmeat, Gobo, Smelt Roe, Avocado wrapped w/ Cucumber. 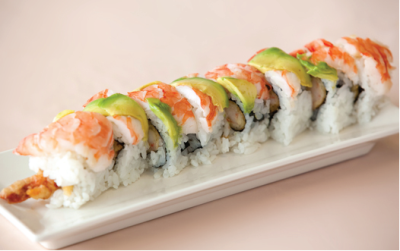 Tuna, Salmon, Crab, Gobo, Avocado, and Smelt Roe (Soy Paper). 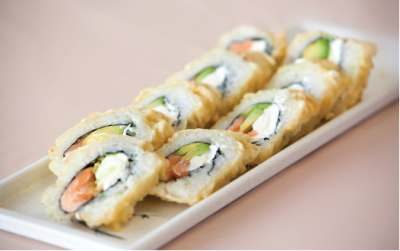 Deep Fried Salmon, Avocado w/ Cream Cheese w/ Sauce. 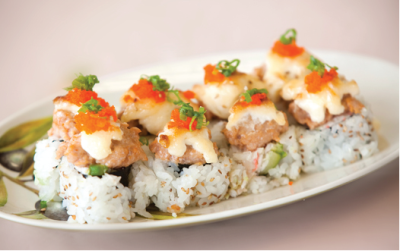 Deep Fried Spicy Tuna and Cream Cheese w/ Jalapeno w/ Sauce. 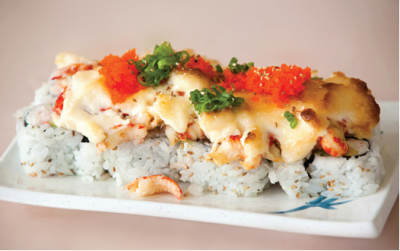 Scallops, Crab, Tempura Flakes w/ Spicy Tuna on top. 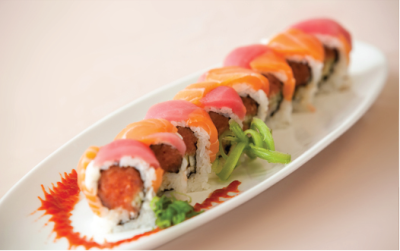 California roll w/ Baked Salmon on top w/ Mayonnaise w/ Sweet Sauce. 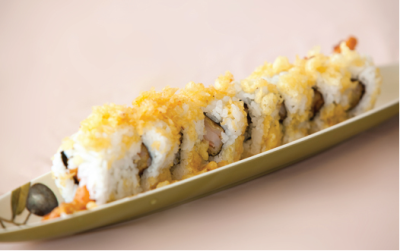 4pcs Crispy Rice w/ Spicy Tuna on top. 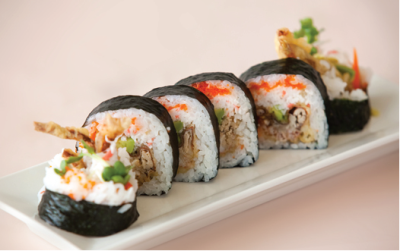 Sushi 6pcs(Chef Choice) w/ Roll ( California or Spicy Tuna ). 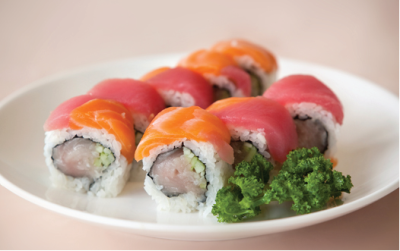 Sushi 12pcs (Chef Choice) w/ Roll ( California(1) and Spicy Tuna(1) ). 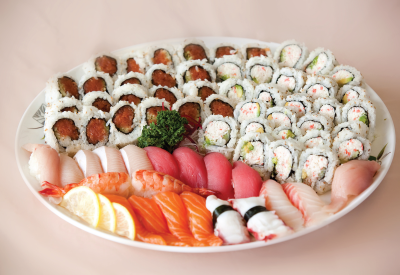 Sashimi 6pcs Tuna(2), Salmon(2), Albacore(2) w/ Sushi 6pcs (Chef Choice). 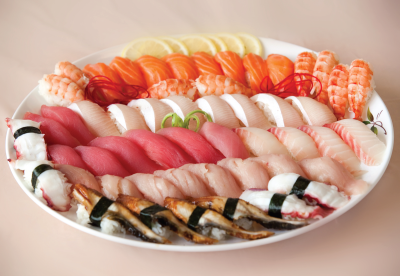 Sashimi 16pcs ( Tuna(4), Salmon(4), Albacore(4), White Fish(4) ). 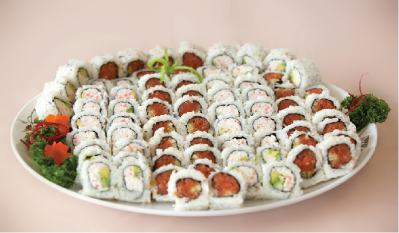 40pcs California Roll & 40pcs Spicy Tuna Roll. 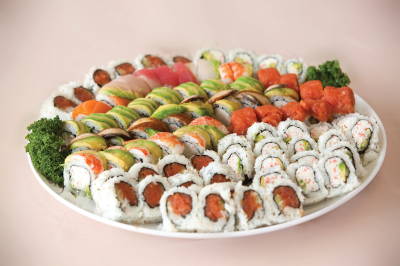 24pcs California Roll & 24pcs Spicy Tuna Roll & 20pcs Sushi. 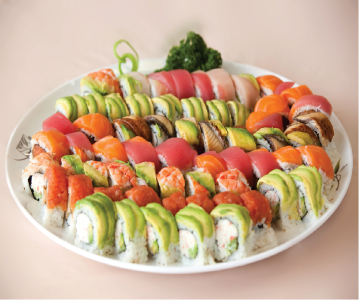 20pcs California Roll & 20pcs Spicy Tuna Roll & 40pcs Special Roll. 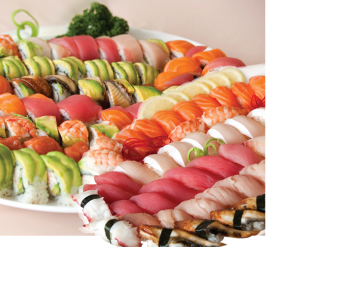 40pcs SPecial Roll & 25pcs Sushi.